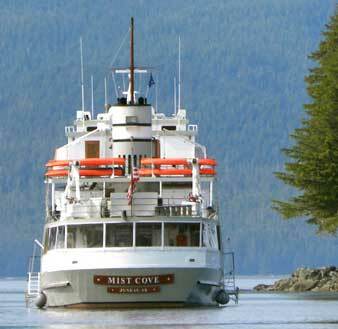 The Boat Company has been plying the waters of the Inside Passage since 1979 as a non-profit educational organization. They offer eco-cruises with an emphasis on conservation. To date, The Boat Company has reinvested between $25-30 million in conservation efforts. The itinerary is flexible and spontaneous and the small guest compliment of just 20 or 24 allows for getting to know your ship mates quickly. Like minded travelers that enjoy hiking in the forest, beach combing, occasional fishing, canoe and kayak trips will fit perfectly with this experience. Travel on the Mist Cove and the Liseron and please, leave the fancy duds at home! Click The Boat Company to see our video. Download PDF 2019 Schedule and Prices Download PDF 2020 Schedule and Prices or Email for more information today.